A middle-aged woman I know never wears makeup or skirts and keeps her hair short. Sometimes she receives concerned glances when she enters the women’s locker room at the gym she patronizes and, while no one has ever questioned her gender (for the record, she is straight and married), she often feels the need to make a gesture to put people at ease, such as saying something out loud in a conspicuously feminine tone. Even outside the gym, when she uses a public restroom she plays it safe by choosing the unisex lavatory for disabled people, if one is available. I think of this woman whenever I read about the public restroom controversy surrounding transgender people in the United States. The issue comes down to whether or not they can use the bathroom designated for the gender they identify with rather than the one designated for their anatomy, but even beyond that idea is the more complicated matter of stereotypes: that people are expected to look and sound a certain way so as to maintain culturally determined gender roles. My friend is a woman, but she doesn’t adhere to society’s conventional image of a woman and thus makes some people uncomfortable. 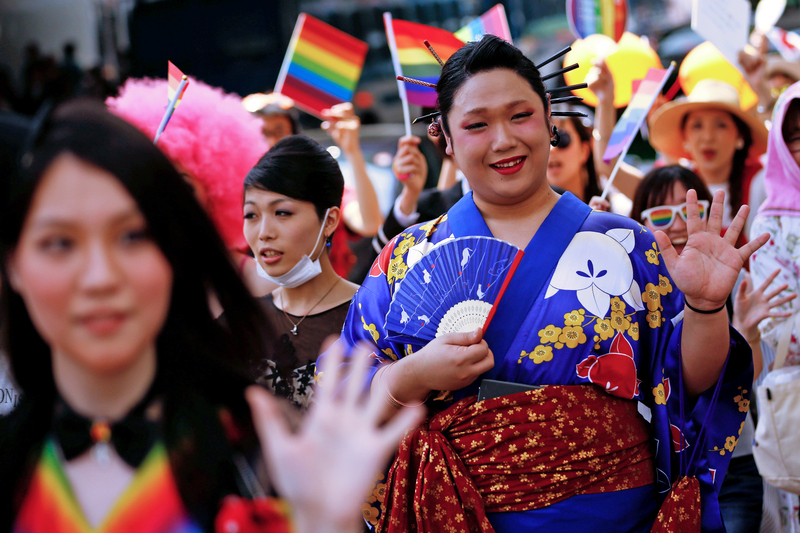 The media have always been essential to the reinforcement of these stereotypes, which is why the coverage of last month’s Tokyo Rainbow Pride parade was a surprise. The parade is a celebration of sexual diversity. LGBT (lesbian, gay, bisexual, transgender) individuals can be themselves and express their solidarity as sexual minorities. However, in the past, major media outlets rarely covered the parade, and when they did they obscured the faces of the participants, which had two purposes. On the one hand it was meant to protect the participants’ “privacy” and on the other it relieved viewers of the burden of having to acknowledge people who weren’t with the program, so to speak. Both ideas are patronizing, because by appearing in the parade the participants are in fact inviting scrutiny. That’s why it’s called a parade. If they prefer being incognito, they can cover their faces themselves. What was refreshing about the coverage of this year’s event was not only that fewer people covered their faces, but that TV news shows didn’t hide those faces either. The media still lags in some areas. Last month the Mainichi Shimbun interviewed Mineko Nomachi, a writer and transgender woman who protested to Nippon TV when it featured her on a variety show and introduced her as an “onee talent.” “Onee” is a slang term reserved for TV personalities whose selling point is that they are nominally men with feminine characteristics, either gay or transgender. Nomachi objects to the word, which she believes is discriminatory and reductive. NTV acknowledged her objection but did not apologize. Nomachi advocates for greater acceptance of LGBT individuals in Japan, understanding that in order for them to be granted all the rights citizens enjoy, they have to assert those rights, and that means “coming out,” to use the accepted term. The media and the authorities don’t demonize sexual minorities as their counterparts in other countries often do, but they haven’t encouraged open recognition either. Their rationale of “respecting” LGBT people’s right to privacy, while ostensibly sympathetic to their situation, only works to keep them marginalized and unfulfilled in realizing their rights. Consequently, even LGBT people who believe that their sexual orientation or identity are no one else’s business know they need to make it other people’s business if they are to gain those rights. The central government is also showing signs of progress. The ruling coalition and the opposition have each proposed their own legislation. The latter’s aim is to discourage discrimination against LGBT people, while the former’s promotes “understanding” of their situation, though the bill itself betrays the coalition’s own lack of understanding. When asked by the Asahi Shimbun about this difference in approach, a representative of Komeito said it’s “too early” to make laws prohibiting discrimination since most people haven’t grasped the meaning of LGBT issues, but if you read the text of the bill, it says that the long-term aim of the legislation is to “make a society in which it isn’t necessary for people to come out.” The Liberal Democratic Party and its partner seem to think that what LGBT people want is the freedom to be left alone, which may be true up to a point, but what the worldwide LGBT rights movement has proven is that “acceptance” is difficult if LGBT people remain in the shadows. More to the point, the LDP’s opposition to gender-free education contradicts the idea of promoting understanding of LGBT people. Tomomi Inada, the LDP’s policy research chief, attended the Rainbow Pride parade and told the Asahi that she doesn’t use words like otoko-rashisa (manliness) or onna-rashisa (womanliness), but the LDP’s insistence that gender distinctions be encouraged in school pushes conventional social roles for men and women that bother many LGBT people. These roles were recently discussed on TBS radio’s “Session 22” by Mameta Endo, a transgender man, and Maika Muroi, a lesbian. The two author-activists were talking about new teacher guidelines issued by the education ministry about how to help LGBT students. 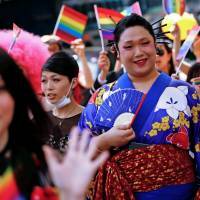 Though they think the guidelines are a positive step, they also find them limited in that they don’t take into consideration the fact that LGBT represents a wide spectrum of sexual orientations and gender identities, whereas Japan’s education system is built on a foundation of clear-cut gender distinction. Endo, who was born female but identified as male, hated his school uniform and dreaded using the bathroom lest he run into female classmates. Since socialized gender identity is second nature to most people, it’s difficult for them to empathize with sexual minorities and appreciate what LGBT people go through on a daily basis. My friend would not call herself a cross-dresser, but she suffers similar indignities from narrow-minded people simply because she doesn’t like feminine accoutrements. There’s more to sexual differences than anatomy.